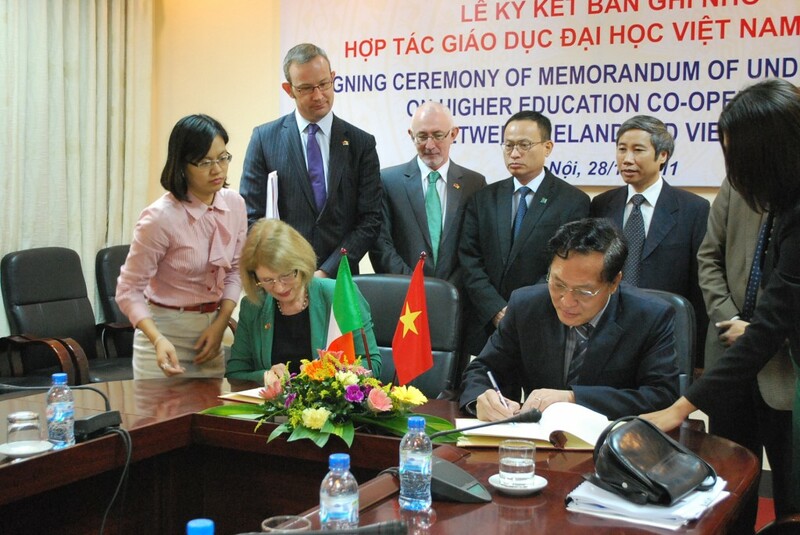 Simon Roughneen in Hanoi – Ireland and Vietnam today launched a deal aimed at increasing the number of Vietnamese students taking third-level courses in Ireland. Currently 40 Vietnamese are enrolled in Ireland’s universities, mostly funded by Irish Government scholarships. To compare, 6000 Vietnamese are studying in the UK, and elsewhere, tapping the Asian student market has created a multi-billion dollar industry within Australia’s third-level education system. Last year 25,000 Vietnamese were part of a total of 240,000 Asian students who enrolled in Australia, up from 180,000 in 2008. Quynh Luy, 24, recently returned to Vietnam to work at the National Institute for Hygiene and Epidemiology, after spending one year at University College Dublin studying Clinical and Diagnostic Virology. “It was a good environment to study in”, she recalled, “and I am glad to be applying what I learned at home”. As a one-party state governed by the Communist Party of Vietnam, the country is not noted for open political debate – despite over two decades of market-based economic growth. However, some policy areas – such as education – on occasion feature vigorous discussion in the country’s legislature. Amid these public concerns about domestic educational quality, graduating from a foreign university is seen by Vietnamese as a ticket to a better job at home.With Australia tightening visa regulations for foreign students, it could offer Ireland an opening to attract fee-paying students from Asia. Ireland hopes to attract some of the 1500 Vietnamese who receive scholarships from the Vietnamese Government each year to study abroad, though awareness of Ireland as a possible study destination remains low. Nguyen Mai Chi studied Human Resource Management at Dublin City University in 2009, but said that many of her friends were curious about her choice of Ireland over more familiar locations such as Australia or Singapore. “Where is it? Is it like Iceland? Do they speak English? These are the questions my friends here were asking”, she recalled. Aid and trade are also on the agenda for Min. O’Sullivan in the former French colony, where today she launched a €55million five year plan for Irish aid to Vietnam, and will meet local and Irish business people seeking to invest in an economy which has grown at an average of 7% per annum over the past decade, boosting average incomes to over US$1000. Vietnam is now struggling with 20%+ inflation, however, and noting Ireland’s post-2008 economic woes, Vietnam’s Deputy Minister for Planning and Investment Cao Viet Sinh said that “we appreciate the support of the Irish Government to Vietnam, especially in the context of the Irish public debt”.Despite another looming austerity budget at home, Min. O’Sullivan said that Ireland’s aid to Vietnam would continue, as part of a broader strategy to boost Ireland’s presence in southeast Asia’s third-largest country. Citing “strong public support” for Ireland’s aid programme, O’Sullivan linked Ireland’s aid strategy to trade and investment policy in Vietnam. She said that “we have enjoyed strong export growth despite the downturn” and assessed that “exports can provide jobs at home”.